Well, I guess most of you can guess who is the main sponsored for this event, it's KINOHITMITSU ! I'm sure most of you have already heard or seen their brand at pharmacies.. They are known for their beauty, detox, & health drinks.. I'm really lucky to be one of the butterflies who was invited to join this awesome Hawaiian themed party ! I was already a Kino user, I really love drinking their beauty drinks.. It doesn't only helps you with your complexion, it also taste so YUMMMY ! cause normally, beauty drinks can be a bit bitter or taste kind of weird. With the starting of every event, there is sure a purpose. 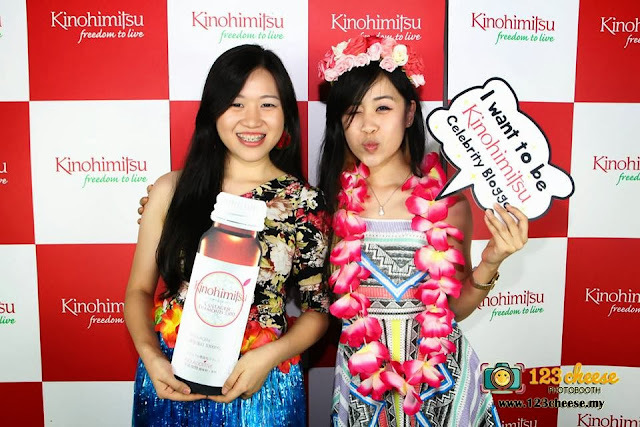 :) So other than partying and taking nice pictures.. Kinohitmitsu is actually launching their latest product which is the Bio-booster ! Kinohitmitsu J'pan Bio-Booster is the very first & only symbiotic-organic blend that enhances our body to absorb nutrients by more than 2 times ! It's fully packed with high-performance probiotics, prebiotics and vitamins, which helps to easily absorb nutrients from our food intake & supplement for a better & faster result ! This product is really suitable for people with low immune system, people who gain weight very fast, weak digestion, constipation/ diarrhea, allergies, leaky gut, brain fog, and alcoholics..
How should you consumer ? It's really simple and easy. You can choose to mix it with plain water or just simply just open a packet and eat it directly. Kinohitmitsu invited two of our local artist to explain their experience after consuming Kino's product. & they had really good feedback. The male artist, is actually already 40 years old, and he is still able to keep such a fit body. His actually working towards to form a define 6-packs ! Cause it's actually quite hard to still be fit at that age, but with the help of Kino, he was actually flashing around his amazing body ! haha.. However, for the female artist actually gave a feedback on their beauty drink, which she manage to get a even fairer and more even skin tone by drinking Kino's beauty drink ! 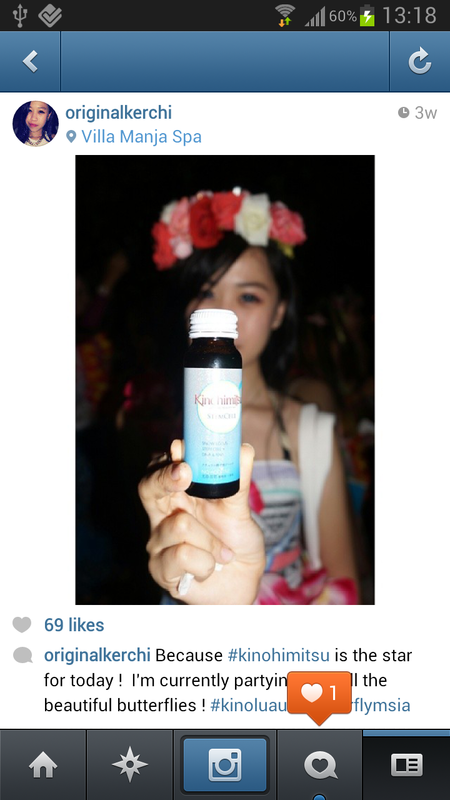 ( I really need that drink, my skin always have uneven skin tone. :( ) & she's really happy that she found out about kinohitmitsu to help her with her problem ..
After the full introduction of the Main product, Tammy (our mama-san) & Illy from The Butterfly Projects gave a quick intro of the whole event. We were given cute cards for us to go to stations to play games & to spin-the-wheel to see our luck. :) So cute right the cards? haha. It was really professional, they had their station set up really nicely and there were so many props for us to use to take our pictures. 123 Cheese opens photo booth for all sorts of event, Wedding, Birthday, Anniversary, and Product Launching.. It's really a creative way to keep everyone occupied and also being able to snap all the happy memories ! 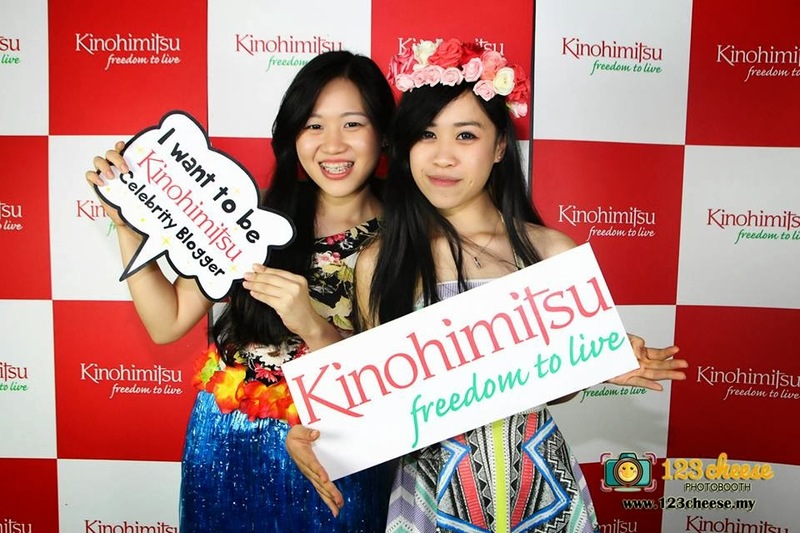 Will definitely consider a photo booth to be in my next 21st birthday ! :DD Fall in love with their photo booth ! *taken from 123 Cheese FB page. Keryi, Chency, Chocky & me. I was really shocked & surprise that i was the winner, cause I taught that my picture was actually really simple. But Thank you so much for giving me this opportunity to win ! I'm such a HAPPY GIRL ! Kinohimitsu's Bio-Booster is really something new for me. Earlier I've mention what is this product's function & how to consume.. the main purpose of this drink is to actually help you with any defects you have with your immune system. That's all for this post ! My Beauty Resolution for 2014 ! Guess x ANTM, Butter Factory KL. Move your talking into Blogging w/ Server Freak ! Loving my Hair with Hair Depot, by K Care.